The ms Eurodam appeals to Multigenerational families and older travelers who value quality and enjoy comforts but aren’t looking for nightlife. B.B. King’s Blues Club offers Memphis-inspired performances. Restaurant menus include signature dishes from the line’s “Culinary Council” of celebrity chefs, such as Marcus Samuelsson, Jacques Torres, Charlie Trotter and David Burke. “Dancing With the Stars”-themed events offer lessons, competitions, and talent from the hit TV show on select sailings. Microsoft-sponsored Digital Workshops are complimentary. Food & Wine Magazine’s co-branded Culinary Arts Center features cooking demonstrations and classes. Tip: The Eurodam has port-intensive itineraries — great for travelers who want to see more destinations, bad for people who love sea days. Staterooms on ms Eurodam are big and serviceable, in sensible shades of beige, with plenty of space to walk around. They feature generous bathrooms, which include deep bathtubs. The majority of outside cabins have sizable private balconies. While there are very few outright perks, the basics are amply covered from in-room flat-screen televisions and DVD players to fully stocked mini-bars and admirable closet space. Digital Workshop – Powered by Microsoft® Windows, daily classes cover a range of computer skills, from how to use email and social networking to courses in photo and video editing. Food & Wine Culinary Arts Center – Star chefs (as well as up-and-comers who have been noted by the editors of Food & Wine Magazine) demonstrate signature dishes for a crowd in an intimate theater, with extensive opportunities for questions and plentiful samples for the audience. Tip: Visiting chefs act like passengers when not demonstrating recipes — they eat and mingle with guests throughout the cruise. Make friends with the toques who topple “Iron Chefs” and take home James Beard Foundation nominations. The Greenhouse Spa and Salon – The spa (part of the brand originally launched by Stanley Marcus, legendary founder of Neiman Marcus) has an extensive menu of treatments combining elements of Eastern and Western therapies. Tip: While everything is a la carte at the spa, including fitness classes such as yoga and Pilates, frequent discounts are offered for treatments on in-port days. The individual restaurants offer considerably better food than the hectic cafeteria-style offerings on the Lido Deck. Alas, at lunchtime, the Lido restaurants and limited room service menu are all that is available. 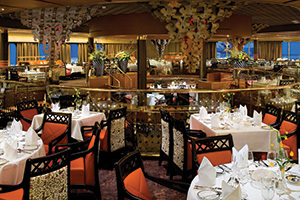 Pinnacle Grill – The only fine dining option aboard ms Eurodam offers the best food on the ship. The room is intimate instead of cavernous, and the cheerful service especially attentive. If you’re marking an anniversary, birthday, or proposal, you’ll want to celebrate here. Tip: One night per cruise, the Pinnacle Grill menu is designed by New York City’s famous Le Cirque restaurant (though some may argue it has the same unevenness as its namesake). Tamarind – The sea views from Asian-inspired Tamarind would be the star of any meal anywhere. The menu includes a mix of Indian, Chinese, Japanese, Vietnamese, Thai, and Indonesian dishes that have been modified for a Western palate. Tip: Holland America Line recently introduced a sustainable seafood program, so its restaurants aren’t trashing the seas upon which they sail. Seek out the sushi at Tamarind for fresh, safe, and sustainably caught maki and sashimi. Rembrandt – The vast dining room belies the size of the ship (it takes up two stories! ), and Rembrandt shines consistently. Tip: The rotating dinner menu includes signature recipes created by the line’s Culinary Council. Look for them: They are typically the best offerings of each night. Microsoft and Windows are registered trademarks of Microsoft Corp. in the U.S. and other countries. 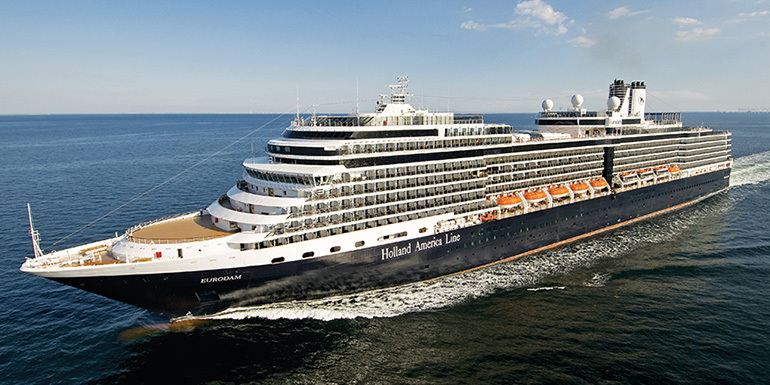 Have you sailed on the ms Eurodam, and if so, what did you like about the cruise?